It is already widely known that many of Samsung's 2018 4K QLED TVs now support AMD/Radeon FreeSync, a variable refresh rate (VRR) standard that can eliminate screen tearing and offer reduced input latencies. Unknown to most, Samsung is also working to support a second VRR standard, a portion of the HDMI 2.1 specifications that offer VRR functionality. Samsung has already showcased this technology working on a 2018 series television, though full support for HDMI 2.1 will likely not ship on TVs before late 2019 or 2020, leaving us with early TVs with partial support for the standard. HDMI 2.1 VRR and FreeSync are both industry standards that offer similar functions, allowing televisions to change their refresh rate on the fly to display content as it is delivered. The most widely advertised use of this technology is in the gaming market, though it can also be used for media playback, eliminating the need for interpolation or other video playback techniques when playing content outside of its native framerate. Back at Computex, the HDMI consortium reportedly showcased a Samsung TV and an Xbox One X console using VRR, confirming that both Samsung and Microsoft plan to support both VRR standards. Earlier this year, AMD confirmed that they plan to add support for HDMI VRR with a future Radeon driver update, supporting the new VRR standard alongside FreeSync. Nvidia has not commented on HDMI VRR support at this time. 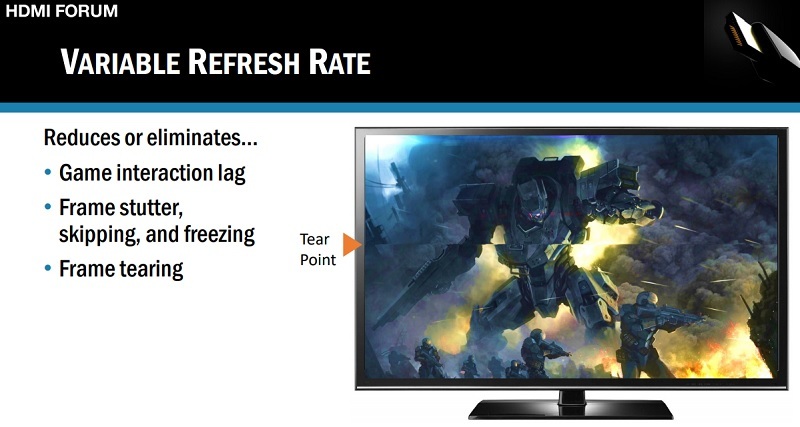 Radeon Software will add support for HDMI 2.1 Variable Refresh Rate (VRR) technology on Radeon RX products in an upcoming driver release. This support will come as an addition to the Radeon FreeSync technology umbrella, as displays with HDMI 2.1 VRR support reach market. You can join the discussion on HDMI 2.1 VRR and Samsung and Radeon's plans to support the standard on the OC3D Forums. While it would be nice if Nvidia supported it, They really don't have to as long as G-Sync is making them money, And it's making them a lot of money. They can still push themselves out of the market though if they dont adapt to new tech coming through. So I agree in that Nvidia should support it. You can get a UN49NU8000, which is the entry level model that supports FreeSync and VRR for under $800 right now. You don't have to be a millionaire to be able to afford it. Also, these Samsung sets will BLOW AWAY the G-sync big screen monitors for picture quality, ESPECIALLY the Q9 series.